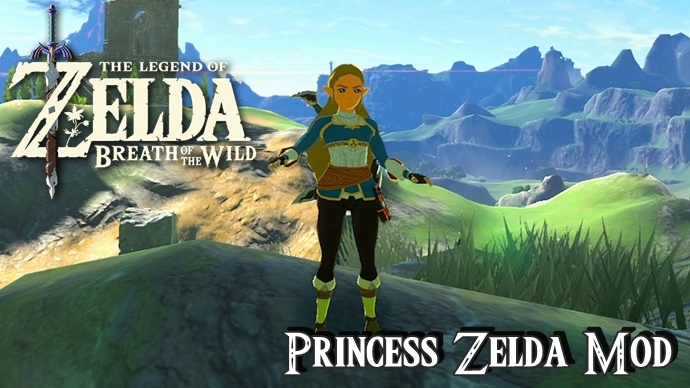 YouTuber and Modder TrollSquad57 has showcased a number of mods, replacing the main protaganist Link for the Princess of Hyrule herself, making Princess Zelda as a playable character in Zelda: Breath Of The Wild (Wii U version). He has uploaded a number of videos to his YouTube Channel that shows Princess Zelda doing pretty much anything Link can do. TrollSquad57 has even uploaded a video that shows a mod that extends to making the voice effects to sound more feminine and more in tune with the princess. It’s not just the main character model that has been modded though. A number of outfits have been modded as well. The likes of the flamebreaker and Snowquill Outfit have been adapted to be fitting for a princess’s attire. Some can be considered palette swaps and others are designed on other character’s attire like Urbossa’s dress for the Gerudo Veil. The most incredible part about these mods are that these videos are from the Wii U version of Zelda: Breath Of The Wild, not an emulator. Whilst the no mods exist yet for the Nintendo Switch version, if you have a homebrewed Wii U, you can add these mods to your console and play as the titular princess on her own adventure, to save… herself? Of course, there is yet a mod that has you rescue Link instead of Zelda but I am sure that will come soon enough. I mean if modders can change Hinox’s into Shrek and the Blight Ganon’s into possessed champions, surely we will eventually see Link having to be rescued by a Master Sword wielding Princess Zelda. TrollSquad57 didn’t make all these mods himself and has had help from other modders to help get them right. As a true gent, he credits everyone who helped with a certain mod in all of his videos. Modders that have been credited include; QNando, KillzXGaming, WilianZilv, mg76, corvo, Queeropatra and LynardKiller. If you would like to see the rest of his videos as there are quite a few, be sure to check out his YouTube Channel. Thank you for reading this article. If you enjoyed this article and would like to read more of our News, Reviews, Interviews, Giveaways and more, then be sure to Subscribe to our Mailing list. You can also Like us on Facebook and Follow us on Twitter.